Despite starting the season almost exactly to script, the last month of football has thrown up a number of unexpected results that has left finals spots in season 3 of the AFLW up for grabs into the last week. No side has locked away their top two slot yet, with just five games of footy left. HPN is going to launch into this week’s look at the scenarios, as is fitting, with a look at the 1982 FIFA World Cup in Spain, and the final game of Group 2 between West Germany and Austria. The Algerians that year had stormed into the tournament as unknowns with some good results, and were taken lightly by the cocky West Germans. They had a fast and fluent style and surprised the world with a 2-1 win, the first African team to beat a European one. They followed up losing to Austria and then beating Chile, leaving them on 2 wins after their 3 games. The final game in Gijón happened after Algeria concluded their third game, and saw Austria entering on 2 wins and West Germany on 1 win. Both teams knew what they needed to qualify. As it happens, a West German win would leave three sides on 2 wins, and a small 1 or 2 goal winning margin would put both them and Austria ahead of the Algerians on goal difference. West Germany scored early and the two sides spent the rest of the match barely attacking, completing over 90% of their passes; barely making a shot or a tackle. The fix was in, and the Spanish crowd chanted alternately for Algeria, for the teams to go home, and for them to kiss. The Anschluss Game changed soccer, as subsequently the final games would be played simultaneously. The Disgrace of Fremantle Oval? Simply put, thanks to the AFLW’s short season and conference structure, Fremantle and North Melbourne may have the chance to play out a mutually beneficial draw which determines finals qualification. Melbourne play Adelaide at Casey on Saturday afternoon followed by Fremantle hosting North in the evening. If Melbourne beats Adelaide, four teams will sit on 5 wins with only two able to qualify for finals. If Fremantle and North find themselves in that situation, they would be able to draw their game and ensure they both qualify for finals on 22 points, 5.5 wins, both ahead of Melbourne and Adelaide. It’s rare that the opportunity to so cleanly secure a mutually beneficial qualifying result presents itself. It’s pretty rare in the longer seasons of domestic sports. But a number of factors made the doomsday scenario more likely in this AFLW season. First, with a short season, every AFLW season so far has seen teams miss qualifying by very slim margins, often a matter of a couple of goals, maybe just the impact on percentage of playing GWS or Brisbane in one of their common late summer storms. There’s just not much chance for teams to really separate and differentiate themselves. This year, there’s also reduced numbers of direct competitors thanks to the conference structure. Five teams is barely more than a World Cup pool. That makes teams being nearly inseparable even more likely. A single 10-team ladder would see all four sides in the current Conference A as the top 4, a group unlikely to change with the week’s results (bearing in mind the lopsided fixture created imbalances here). With qualification based purely on conference ladder position and no provision for “next best record” entry, there’s no scope for conference imbalance to be corrected for. 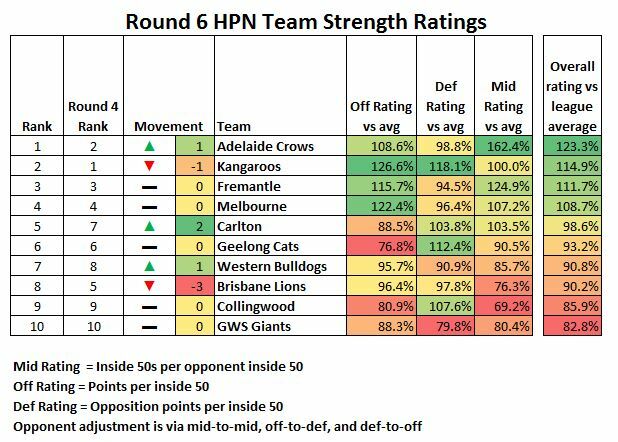 This is a pure design fault and compounds the error the AFL made in not seeding conferences with any reference to expected team strengths from personnel changes. For all these reasons it was more likely in the AFLW than in longer leagues that a scenario like this would emerge. Firstly, it may be advisable for the AFL to reschedule the two games in question to occur simultaneously to eliminate the even the possibility of a pacted result. This would probably be good practice were a similar scenario to emerge in the men’s season as well. The key question would be whether the two sides could trust each other to uphold a bargain in a game as dynamic and with such rapidly changing scores as this. Perhaps the most obvious method be to literally not engage, to sit down and play out a 0-0 draw. The dilemma is ultimately one of bargaining power. West Germany had the bargaining power in 1982 because they were a better side and needed to win to qualify, with Austria risking, in a competitive game, conceding enough goals to miss out. In this case, while we suspect North might be the better side, it’s more of an unknown and scores can vary more wildly than in soccer. Fremantle would give up any chance of gaining top spot, but they may prefer that to the risk of missing finals altogether. North and Freo might both like the possibility of eliminating Adelaide, a team which beat both of them pretty handily, as potential grand final opponents. They would also be not risking injury before the finals – critical to the chances of both teams moving forward. Would they be breaking any rules? Maybe. The AFL Rules clearly outline an offence of bringing the game into disrepute, at rule 2.3. This type of action may be considered as being unbecoming or prejudicing the interests of the game. Just this week in cricket, Norths in Brisbane were charged with a similar offence to attempt to game their opponents in the finals – and the organizers of the competition promptly thwarted their attempts. However, HPN cannot find any clear evidence that these rules apply to the AFLW – nor any clear document outlining the rules of the competition. As such, HPN can only speculate that a similar rule would exist. Playing out a mutually beneficial result when the opportunity presents itself is perhaps unsporting, and would be looked down on by many, as we saw in Spain 1982, but at the end of the day it’s hard to argue against getting the result needed. There may be a defence present for the clubs, and it may spark the AFL into fixing the clear flaws with the organisation of the competition. The fault lies in large part with the designers of a flawed league. Such a farce might well serve as a fitting epitaph to a season whose negligent structural design has caused serious imbalances from its very beginning. If the Disgrace of Fremantle doesn’t happen (it won’t), a small handful of outcomes are possible this weekend. But first, here is the HPN Team Ratings. In Conference A, all Adelaide have to do to make the finals is to win against Melbourne. Fremantle and North Melbourne also just need a win (or that unlikely draw scenario above). Melbourne will need about a 26 point win (depending on total match scoring) to overtake Adelaide into the second finals spot behind the winner of North and Freo. Conference B sees a similar scenario. If Carlton and Geelong win they will be finals bound. Brisbane can still make finals if one of those two sides lose, and they can make up (about) a 13 point gap on Geelong or (about) a 69 point gap on Carlton. Facing the presumptive wooden spooners in Collingwood, such a margin may be possible.